War-date Confederate retained copy of Special Order No. 9, 1pp. small quarto, Head Quarters Camp Henry, Culpeper Court House, May 22, 1861, issued by Samuel Jones, Lt. Col. Asst. Adj. Genl and Ordered by Colonel Cooke. 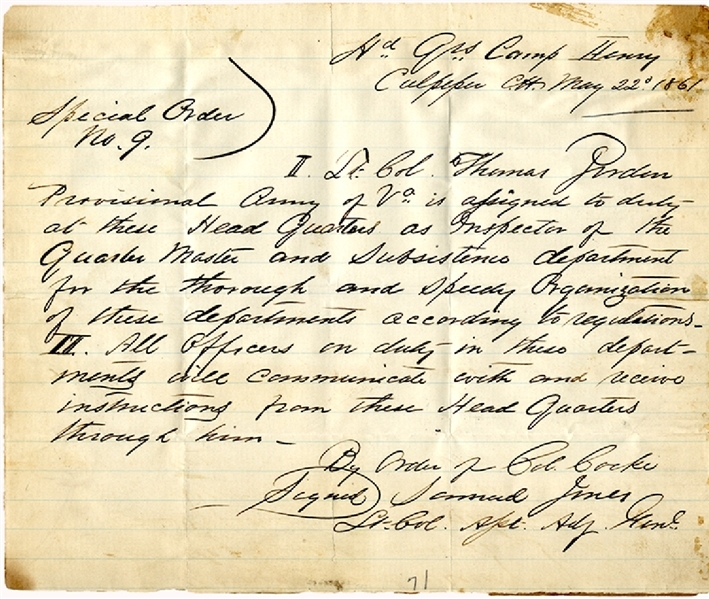 It reads in part: “...Lt. Col. Thomas Jordan Provisional Army of Va. is assigned to duty at these Head Quarters as Inspector of the Quartermaster and Subsistence Department...” Mounted. With 1889 newspaper clipping of “JEFFERSON DAVIS’S REPLY” to an attack on himself by Gen. Wolseley. Good condition.